That's no big revelation, but we cling to the fleeting hope that we can return to the gentler, more stable days gone by . . . especially where our marriages are concerned. But the truth is, we can't, because as the world changes, so do we, and so do our marriages. Let's face it: marriage and the home have altered drastically through the years. Men afraid to be men. Women ashamed of being women. Children unsure of who's in charge. Blended and not-so-well-blended families. Homes that have become battlegrounds. And all of it so unstable, so temporary. In the face of these depressing facts, beloved pastor and Bible teacher Chuck Swindoll offers a refreshing dose of hope and practical help for marriage. 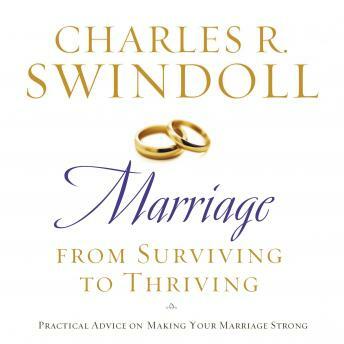 His sage advice, based on the Bible and his own fifty-year marriage, shows us how to move our marriages from just surviving to actually thriving. And that target can be hit dead-center if we rely on God and His Word as our marriage counselor, our guide, our glue.